TRA VINH — The Anh Binh Minh Traditional Art Troupe of the southern province Tra Vinh has lined up a range of shows to celebrate the Khmer New Year, Chol Chnam Thmay, from April 13 to 15. Dozens of its artists have fanned out around Tra Vinh, Soc Trang and Ca Mau provinces for performances based on the culture and lifestyle of the Khmer. 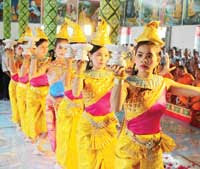 Dressed in traditional ethnic clothes, young and veteran performers sing and dance, but also perform serious plays focusing on the religion, traditional customs, and arts of the Khmer people. "Our performances showcase the beauty of the Khmer spirit," said Meritorious Artist Kim Thinh, head of Anh Binh Minh, one of the province’s leading art troupes. "We hope our shows enable young people to improve their knowledge about tradition, understand the greatness of their country’s rich culture, as well as learn useful lessons about love, life and people," he said. In Ca Mau, Thinh and his colleagues have visited remote districts like Thoi Binh, Tran Van Thoi, and U Minh, performing in front of several thousands of people. "We’re not looking to make a profit from these shows but we hope to encourage young people to love their culture more," said Thinh, who often travels with his staff by boat to remote areas to meet their fans. "Chol Chnam Thmay is a time for people, especially youth, to celebrate after a year’s hard work and studies," Phan Huu Hung, a farmer in Thoi Binh District, said. "We love to see Anh Binh Minh artists because their shows are quality and feature our Khmer culture," he added. As in past years, the troupe along with many others is putting up free performances during the festival. There are nearly 1.3 million Khmers in the Mekong Delta, chiefly in Soc Trang and Tra Vinh. Local residents and visitors have flocked to participate in music programmes, traditional games, and sports competitions launched at the beginning of this month by local authorities.